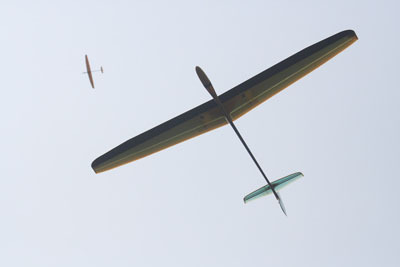 I've had more than 45 years experience flying sailplanes and gliders of all types, except not much handlaunch until the 90's. For me, handlaunch is a bit more of a 'new' thing, considering my other experiences, but has quickly became the most interesting, and a lot of the time, most gratifying. What I like most about handlaunch is the convenience of it. I always keep one 'charged up' for that last minute flying session. You can fly 'em at a schoolyard by simply walking to the middle of a field and tossing hard. Almost no preparation is necessary, just launch and search for lift! The more you launch, the more thermals you will find, AND the better overall pilot you will become. Another thing that I find is the therapeutic aspect of handlaunch. I find that after just a few minutes of tossing and searching, I feel better. It is a great stress reducer. There's one more thing I can think of that HLGs do that you just can't do with any other type of airplane: get aloft and stay aloft by the lightest of slope lift. In some fields or other flying areas, ones that have a rise or just the slightest place for slope lift to start, you can get a handlaunch to 'slope' soar. I've flown a HLG for hours or longer by sloping off the front edge of some short cypress trees at the end of a field near where I used to live. I've also used the slope lift from the front of a large house with the correct wind direction. Sometimes while flying thermals, you'll get a bit of slope lift at the same time. Hey, lift is lift; just take advantage of it whenever you can! Just remember to try to keep your plane as light as possible and build accurately. Click here to get a table of relative weights of most popular covering materials for handlaunch (and other aircraft). If you have some stories or other comments that you'd like to share with others about this subject, please write me mail and I'll be glad to post it.